خدادادی, محمدرسول, فراهانی, ابوالفضل, قاسمی, حمید, هنری, حبیب. (1396). مطالعه عوامل موثر بر وفاداری به ارزش ویژه برند مبتنی بر هوادار(FBBE) در باشگاه‌های لیگ برتر فوتبال ایران. 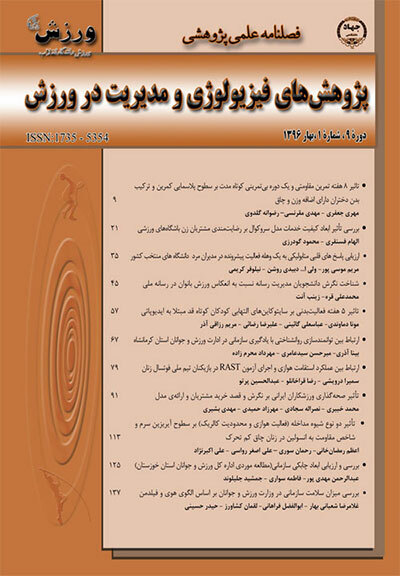 پژوهش های فیزیولوژی و مدیریت در ورزش, 9(2), 35-49. محمدرسول خدادادی; ابوالفضل فراهانی; حمید قاسمی; حبیب هنری. "مطالعه عوامل موثر بر وفاداری به ارزش ویژه برند مبتنی بر هوادار(FBBE) در باشگاه‌های لیگ برتر فوتبال ایران". پژوهش های فیزیولوژی و مدیریت در ورزش, 9, 2, 1396, 35-49. خدادادی, محمدرسول, فراهانی, ابوالفضل, قاسمی, حمید, هنری, حبیب. (1396). 'مطالعه عوامل موثر بر وفاداری به ارزش ویژه برند مبتنی بر هوادار(FBBE) در باشگاه‌های لیگ برتر فوتبال ایران', پژوهش های فیزیولوژی و مدیریت در ورزش, 9(2), pp. 35-49. خدادادی, محمدرسول, فراهانی, ابوالفضل, قاسمی, حمید, هنری, حبیب. مطالعه عوامل موثر بر وفاداری به ارزش ویژه برند مبتنی بر هوادار(FBBE) در باشگاه‌های لیگ برتر فوتبال ایران. پژوهش های فیزیولوژی و مدیریت در ورزش, 1396; 9(2): 35-49. نگرش‌های تداعی برند با ضریب استاندارد شده 552/0 بیشترین تاثیر را بر وفاداری دارد. This study aimedatinvestigating the factors affecting loyalty to fan-based brand equity (FBBE) of Iran football super league clubs.This study was descriptive-analyticalconductedas a survey. The statistic population consisted of football club fans of Iran 13thfootball super league and 880 subjects were selected as the sample by stratified and cluster random sampling methods. A researcher-made questionnaire of FBBE with 45 items in 7-point Likert scalewas used to collect data. Content validity of the questionnaire (CVI=0.91) was confirmed by 10 experts. In a pilot study, the reliability was obtainedby test-retest (ICC=0.89) and Cronbach’s alpha coefficient (0.81). Data were analyzed by simultaneous multiple regression in SPSS20. The results indicateda high R2 score and the stronger relationship of the model.Durbin-Watson test showed no correlogram and independent errors in criterion variable. F test revealed a linear significant relationship between predictor and the criterionvariables.Brand association attributes, attitudesand identity had significant effectson brand loyalty (P<0.001). The brand association benefits had no significant effect on brand loyalty (P˃0.05). Brand association attitudes with a standardized coefficient of 0.552 had the greatest effect on loyalty. احسانی، محمد و جوانی، وجیهه(1392). بررسی تأثیر نام تجاری تیم‌های موفق بر میزان وفاداری هواداران در لیگ برتر فوتبال ایران، پژوهش‌های کاربردی مدیریت و علوم زیستی در ورزش، شماره 2، صص: 98-89. تکلّی، همیلا(1391). مدل‌سازی ارزش ویژه برند مبتنی بر مشتری کمیته ملی المپیک جمهوری اسلامی ایران، رساله دکتری مدیریت ورزشی، دانشکده تربیت بدنی و علوم ورزشی، دانشگاه تهران، صص: 121-125. جلال‌زاده، سیدرضا.،اختیاری، مهناز(1388).ارزش نشان تجاری در صنعت بانکداری، اولین کنفرانس بین المللی بازاریابی خدمات بانکی، تهران، صص:21 -24. جمالی­نژاد. سعید(1388)، بررسی رابطه­ی موجود و چگونگی تاثیرگذاری درگیری محصول بر میزان وفاداری به برند در مصرف­کنندگان گوشی­های موبایل، مجموعه مقالات کنفرانس بین­المللی برند، تهران، صص:11-12. جوانی، وجیهه(1389). مطالعه تاثیر عوامل تداعی برند بر وفاداری به برند در هواداران لیگ برتر فوتبال ایران، پایان‌نامه کارشناسی ارشد مدیریت ورزشی، دانشکده تربیت بدنی، دانشگاه اصفهان، صص: 87-102. جواهری کامل، مهدی و کوثرنشان، محمدرضا(1390). بررسی پیش‌زمینه‌ها و پیامدهای هویت نام تجاری (مطالعه موردی: نام تجاری هاکوپیان)، مجموعه مقالات ششمین کنفرانس بین‌المللی برند، تهران، صص: 4. دهدشتی شاهرخ، زهره.، جعفرزاده کناری،مهدی.، بخشی‌زاده،علیرضا(1391). بررسی دیدگاه هویت اجتماعی برند و تاثیر آن در توسعه وفاداری به برند (مورد مطالعه: شرکت تولیدکننده محصولات لبنی کاله)، تحقیقات بازاریابی نوین، شماره 2(2)،پیاپی 5، صص:105-87. سجادی، سیدنصرا..، خبیری، محمد.، علیزاده گلریزی، ابوالفضل(1392). عوامل موثر بر وفاداری هواداران به برند تیم‌های پرطرفدار لیگ حرفه‌ای فوتبال ایران، نشریه مطالعات مدیریت ورزشی، شماره 18، صص: 100-81. سلطان‌حسینی، محمد.، نصراصفهانی، داود.، جوانی، وجیهه.، سلیمی، مهدی(1390). تعیین سهم نسبی وفاداری به برند از تداعی برند در بین هواداران لیگ برتر فوتبال ایران، نشریه علمی پژوهشی مدیریت ورزشی دانشگاه تهران، شماره 9، صص: 107-87. 10. شلبری، دیوید.، شاین، کواک.، وستربک، هانز(1391). استراتژی بازاریابی ورزشی، ترجمه: هنری، حبیب.، طاهری، مرتضی.، ترابی، فرناز، نشر علوم ورزشی (حتمی)، چاپ اول، تهران، صص: 388-415. 11. کاپفرر، ژان(1385).مدیریت راهبردی نام تجاری، ترجمه سینا قربانلو، تهران: مبلغان، چاپ اول، صص: 38-51. 12. کشکر، سارا.، قاسمی، حمید.، تجاری، فرشاد(1390). مدیریت بازاریابی ورزشی، نشر علم و حرکت، چاپ اول، تهران، صص: 227-242. 13. گنجی‌نیا، حسین؛ اخوان فومنی،سمانه(1390). نقش شخصیت برند بر رفتار مصرف کننده و چالش‌هایبرندسازی در آسیا، پایان‌نامه کارشناسی ارشد مدیریت بازرگانی، دانشگاه آزاد اسلامی واحد رشت، صص: 60-64. 14. محرم‌زاده، مهرداد و اکبری، روناک(1392). ارتباط بین ابعاد وفاداری مشتریان و تقویت برند ملی در لیگ‌های حرفه‌ای فوتبال و والیبال ایران، پژوهش‌های کاربردی در مدیریت ورزشی، شماره 4، صص 78-71. 15. مشبکی اصفهانی، اصغر؛ وحدتی، حجت؛ خدادادحسینی،سیدحمید؛ احسانی، محمد(1392). طراحی الگوی هویت برند صنعت ورزش ایران(مورد مطالعه: لیگ برتر فوتبال)، نشریه مطالعات مدیریت، دوره 17، شماره 4، صص: 201-220. 16.Bauer, H. H., Nicola E. Stokburger-Sauer & Stefanie Exler.,( 2008). Brand, Image and Brand Loyalty in Professional Team Sport: A Refined Model and Empirical Assessment. Journal of Sport Management, 22 (2), pp.206-26. 17.Biscaia, Rui.,Correia, Abel., Ross, Stephen., Rosado, Antonio., and Maroco, Joâo(2013). Spectator-Based Brand Equity in Professional Soccer. Sport Marketing Quarterly, West Virginia University, 22, pp: 20-32. 18.Bodet, Guillaume.,Chanavat, Nicolas(2010). Building global football brand equity- lessons from the Chinese market. Journal of Marketing and Logistics, Volume 22, Number 1, pp: 48-132. 19.Bridgewater, Sue(2010). Football Brands. Warwick Business School, University of Warwick, UK, Printed and bound in Great Britain by CPI Antony Rowe, Chippenham and Eastbourne, ISBN 978-0-230-23253-2, pp: 31-39. 20.Broadbent, Sarah.,Bridson, Kerrie., Ferkins, Lesley., Rentschler, Ruth(2010). Brand Love, Brand Image and Loyalty in Australian Elite Sport. Journal of International Marketing 17(3),pp: 71-86. 21.Cui, Wenbo(2011). Creating Consumer-Based Brand Equity in the Chines Sports shoses market: Measurement, challenges and opportunities. A thesis submitted for the degree of Master of Science in International Marketing, Aalborg University, pp: 84-96. 22.Filo, K. and Funk, D.C. (2008) Congruence between attractive product features and virtual content delivery for Internet marketing communication. Sport Marketing Quarterly, Vol. 14, pp:112–122. 23.Gladden , J.M. & Funk, D.C., (2001). Understanding brand loyalty in professional sport: Examining the link between brand associations and brand loyalty. International Journal of Sports Marketing and Sponsorship, 3(2), pp:67-94. 24.Gladden, J. M. and D. C. Funk (2002), Developing an Understanding of Brand Associations in Team Sport: Empirical Evidence from Consumers of Professional Sport. Journal of Sport Management, 16 (1),pp: 54-81. 25.Javani, Vajihe.,Soltan Hossein, Mohammad., Rahnama, Nader., and NasrEsfahani, Davood(2012). Study of effective factors of fans’ brand loyalty in Iranian professional football league. Journal of Physical Education and Sports Management, Vol. 3(1), pp: 8-13. 26.Kapferer, J. N. (2008). The new strategic brand management. 4th edition London: Kogan Page, pp: 68, 94-101. 27.Keller, K.L., (1993). Conceptualizing, measuring, and managing customer-based brand equity. Journal of Marketing, 57(1), pp:1-22. 28.Koo, JaJoon.,(2009). Brand Management Strategy for Korean Professional Football: A Model for Understanding the Relationships between Team Brand Identity, Fans’ Identification with Football Teams, and Team Brand Loyalty Teams. A thesis submitted for the degree of Doctor of Philosophy, School of Engineering and Design, Brunel University, pp: 175-192 . 29.P. Raj Devasagayam and Chery. L. Buff . Timothy W. Aurand . Kimberly M. Judson;(2010). Building brand community membership within organizations: a viable internal branding alternative?. Journal of Product & Brand Management, 19/3,pp: 210–217. 30.Ross, S.D. & Bang, S.L., (2007). Assessing Brand Associations for Intercollegiate Ice Hockey. Sport Marketing Quarterly, 16( 2), pp:106. 31.Ross, S.D., (2006). A conceptual framework for understanding spectator-based brand equity. Journal of Sport Management, 20, pp:22-38. 32.Ross, S.D., Russell, K.C. & Bang, H., (2008). An Empirical Assessment of Spectator-Based Brand Equity. Journal of Sport Management, 22(3), p:4 .